Hello there, Barry. I’ve got to learn to ride a horse! My husband has been to Santa Fe, but I haven’t. I think I’d like to visit there after seeing how interesting it looks to be. Thanks for dropping by, Candice. It’s a small city, very walkable, and with a lot of things to do. But stay hydrated and wear a hat if you go! Hi Lynette. NM is so vast. You could spend 10 years exploring its deserts. I’d like to go back. Now you have me wondering what else you might have seen. Santa Fe is fun, I agree. 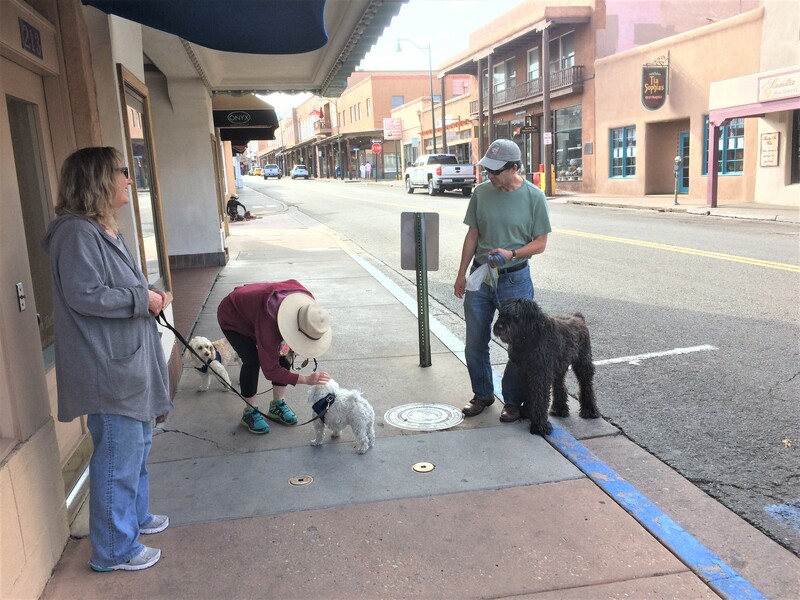 Did you get to La Fonda or Loretto Chapel? Hi Robert. I plan to write at least one more NM piece, so stay tuned. Didn’t visit the two places you mention, though. Hello there, and thanks for visiting. New Mexico is a huge state, one of the largest in the USA. I saw only a very small part of it, but what I saw is excellent. Endless deserts, incredible cliffs and rock formations, etc. And of course, Santa Fe. You know, I regret big-time that I didn’t buy any pottery. I might check out the wares from Fisher Pottery online. 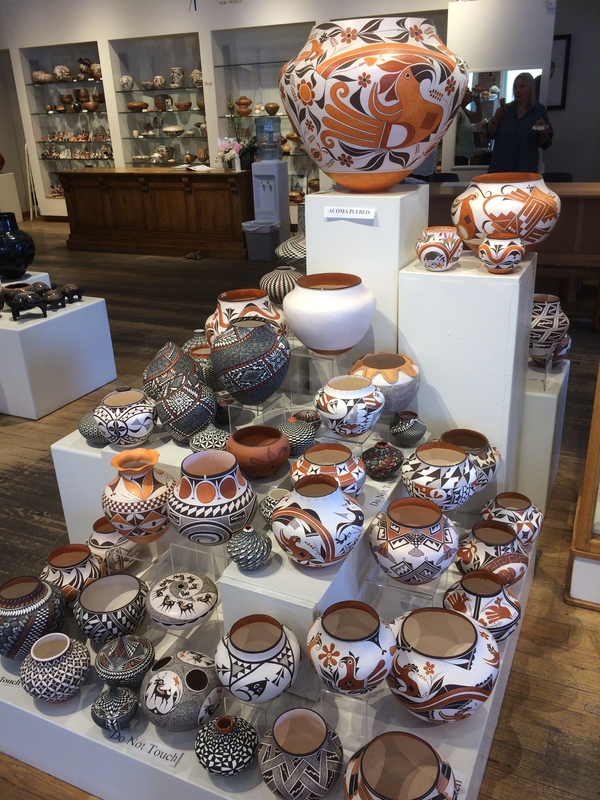 You never can have enough pottery! “Good trips are good for the soul.” Great line, and so true. My great-uncle was an artist and lived in Santa Fe after retiring. I’ve never been there, but it seems like a nice town (also Taos). I think actress Ali McGraw (ex Mrs. McQueen) still lives there. Thanks for the travelogue! Pete, I was in Taos during this trip. It’s okay, but Santa Fe is far, far better. 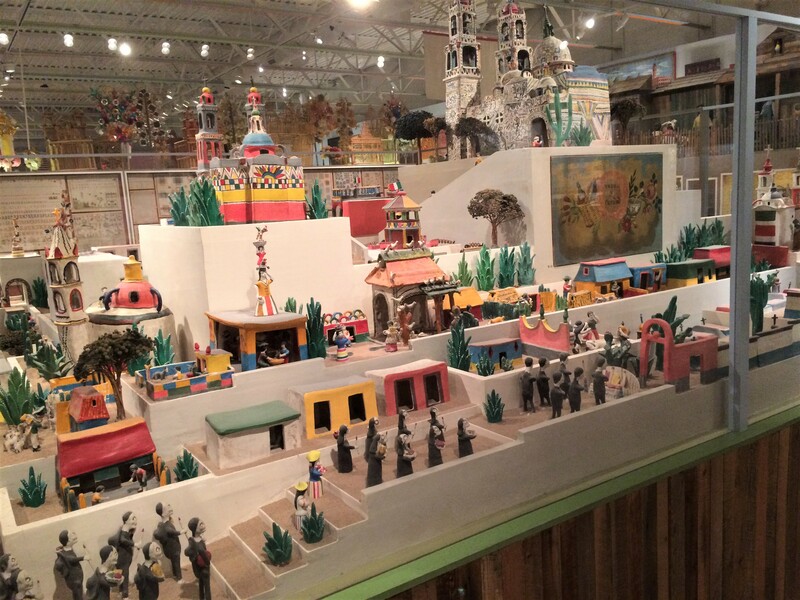 I also loved Santa Fe and surrounding areas…..so much to see. Bandalear National park nearby was fantastic as well as other areas. Right, absolutely. New Mexico is very beautiful. The landscapes are amazing. New Mexico and Arizona have been on our to do list for a few years. Spent 3 months in AZ for Peace Corps training in 1969. Maybe we should push it up to top of list. Sounds like the perfect getaway, especially in its differentness from your normal surroundings. Family is always a great excuse for a trip; I use mine that way all the time (and I mean that in the nicest of ways)! Hi Lexie. It’s true — combining family with sightseeing is a good way to do things. Great tour! I enjoyed all of the details, but the Bouvier dog (a neighbor used to own one) and Georgia O’Keeffe resonated most. I love O’Keeffe’s bold, stunning paintings. Don’t own one, but even a reproduction would enhance my life! Hi Diane. 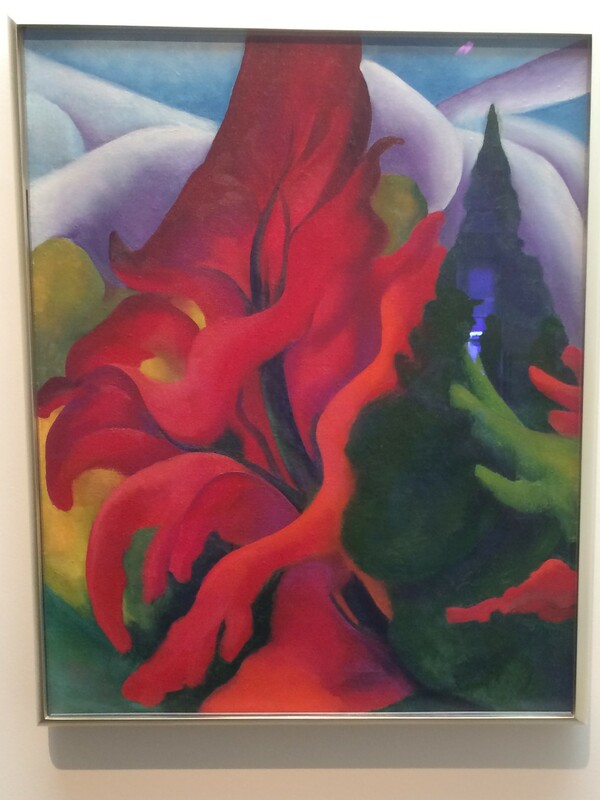 After leaving the O’Keeffe museum, I liked her work even more than I did before. Great use of colors. Very powerful stuff. Thanks Jerry. I think I have at least one more New Mexico story inside me. It hopefully will be launched into cyberspace next week. Interesting. I first came across Georgia O’Keeffe when my girls were studying art at school, but knew nothing about her or what had inspired her paintings. The ceramics look great! O’Keeffe was terrific. The New Mexico deserts inspired her art very much. Thanks for stopping by, Ros. Much appreciated. Hi JT. Before going there, I had no idea that Santa Fe has such a high elevation. The whole desert is WAY above sea level. Yup, Santa Fe has a whole lot going for it. It’s a relaxed, culturally-rich place (as you know). Sounds like a great trip – Good for the soul indeed, especially spending it with close family. Having watched Breaking Bad on telly I feel as if I know the landscape well, very different from my Scotland, but I doubt if I would handle the heat very well. 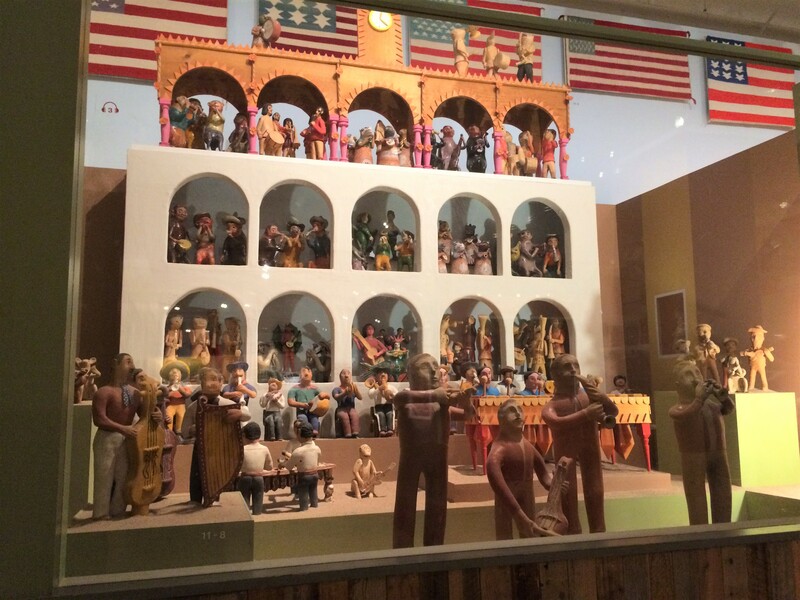 Love the fact that the Girards donated all that folk art to the museum and have their own wing – What a wonderful thing to have done. And, Georgia O’Keeffe – You were spoilt! You know, I’ve never seen Breaking Bad. A lot of people think it’s the best TV series ever. I think it was set in Albuquerque, which is about 60 miles south of Santa Fe. It was indeed but the did cover a fair bit of ground on that show so I can totally imagine where you have just been. I wrote about the song A Horse With No Name when I wrote about Breaking Bad – Very apt. Have enjoyed visits to a few places in the Southwest, but never had an excuse to go to Santa Fe. Thanks for the vicarious trip. 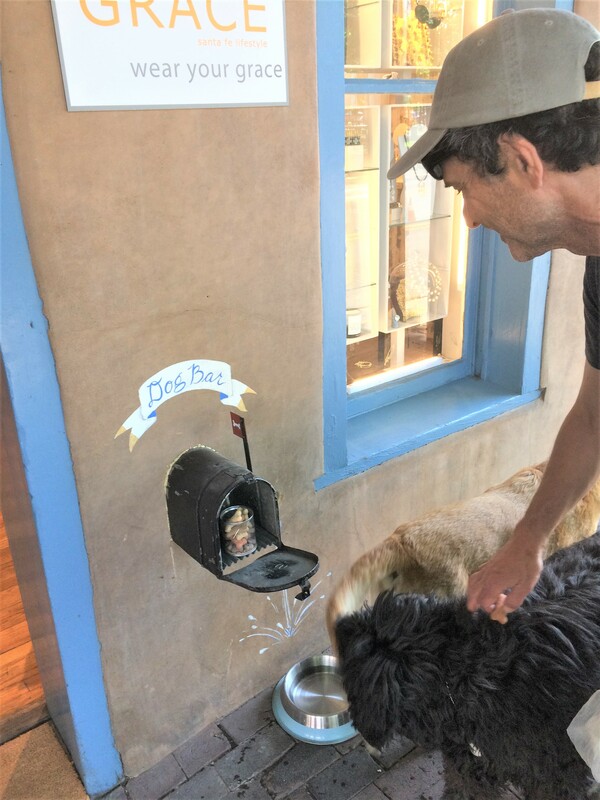 The detail about the dog bar is delightful. Hello there. I’m glad you came along for the ride! It’s true, dogs don’t believe in wearing hats, no matter what the weather. 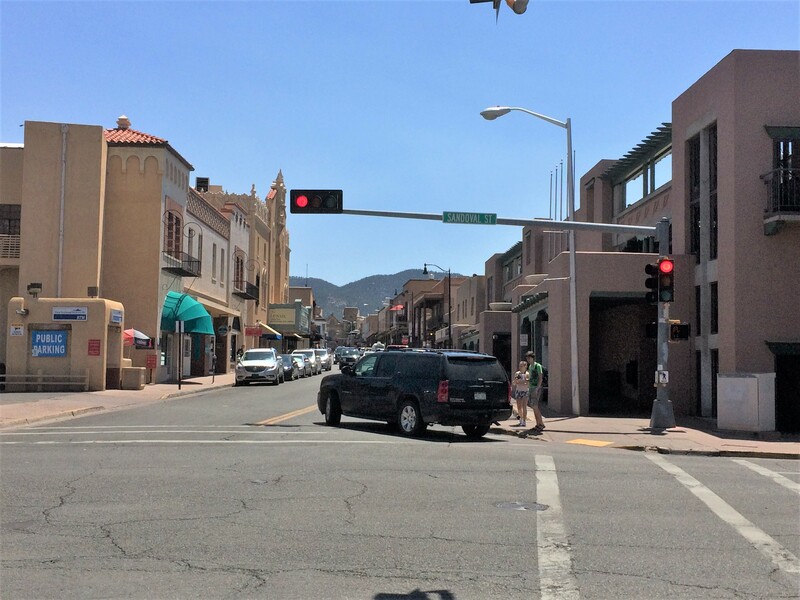 And I would love to visit Santa Fe some day, although I think I’ll wait until the weather is cooler and the drought is over…It certainly looks like a fun place to spend a few days! You’re lucky to have family there. You’re right – – – if Richie and Sara weren’t there, it’s very unlikely that Sandy nd I ever would have gone there. Nice review of one of my favorite towns. I lived there for four years, a long time for me after a usual three years here, three years there, sort of life. I had a little 600 sq. foot adobe outside of the main town in Seaton Village. Hope you had a chance to see Loretto Chapel, a lovely place. Hi. No, I wasn’t aware of LC. Don’t know if Richie and Sara know about it. I’ll mention this to them. Thanks for the great tour of one of my favorite cities (though it still has to get in line behind my SF hometown + NYC, Chicago, Philadelphia, Asheville . . .) I so hope my great good friend Cynthia Coleman was your Folk Art Museum docent; she’s the best. Travel on! Hi Fran. We toured the museum sans docent. If we’d had your friend as our guide, it would have been an even better experience. Thanks for stopping by. I appreciate that a lot. I am glad you and Sandy finally made it to N.M., Neil. 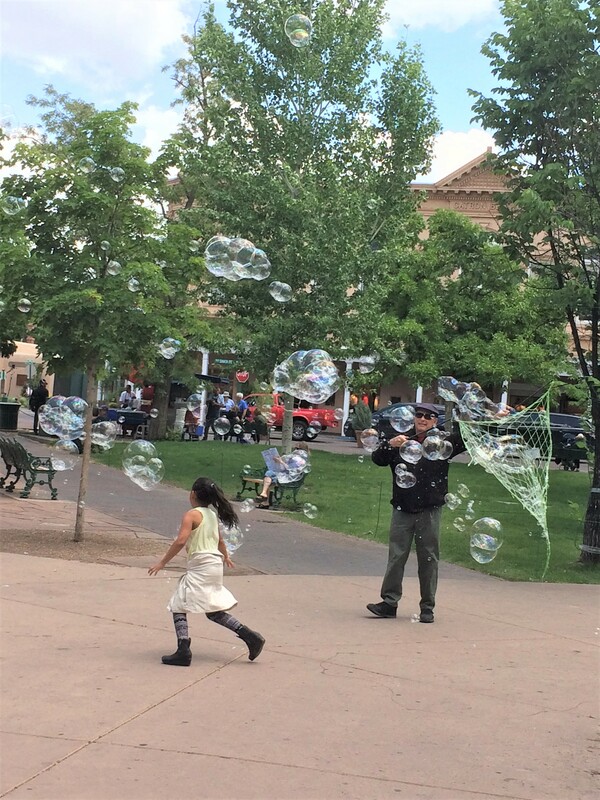 Your lovely summary of your visit to Santa Fe makes me want to return so badly! I can even envision the food cart at the corner of the central plaza. We passed it only last fall. I look forward to hearing and seeing more about your trip. Sandy and I are real glad that we made this trip. We saw and did a lot. New Mexico is beautiful. Looks like a great place to vacation but I wouldn’t be able to stand the heat! Hi Diane. Thanks a lot for adding your thoughts. Yes, the heat (and the Sun’s intensity) definitely takes some getting used to. But there’s plenty of shade in Santa Fe (though that’s not so true in the deserts in New Mexico!). 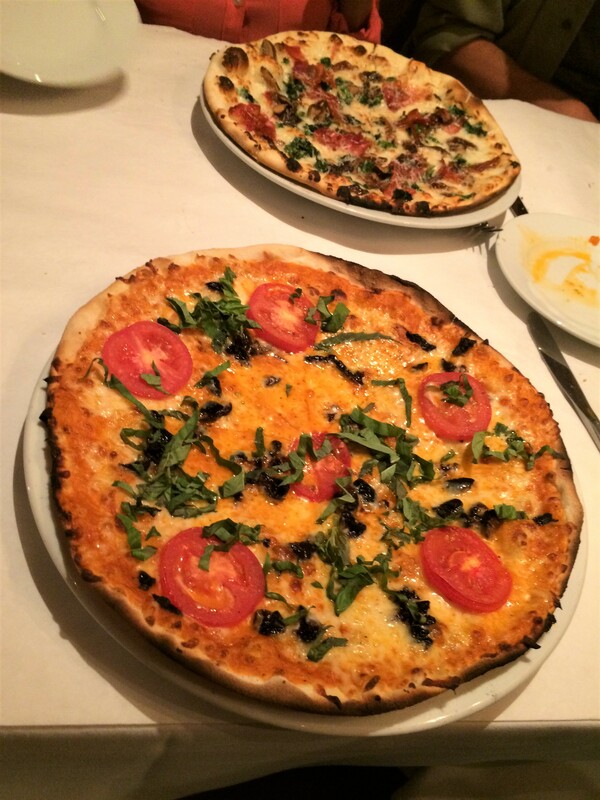 Wonderful post that really took me back and filled me with fond memories of my first visit to Santa Fe with my best friend the summer after I graduated from law school. We had planned it as a stop over and decided to stay for the week, with side trips to Taos, Bandolier National Monument, Chama and more. NM Mexican food three meals a day, burned off with hikes and a day at 10,000 Waves spa. If you get back to NM in October some year, consider Albuquerque for the hot air balloon festival. You’re right. New Mexico is a vast wonderland that would take years to fully explore and appreciate. Thanks, Neil. This is a great way to start the day. Glad you liked this story, C C, and that it brought you back in time. I love hot air balloons. I’m pretty positive that I saw a hot air balloon fest somewhere years ago. But my memory is totally failing me — I can’t recall at all where it was. We’ve driven through there. That’s all, unfortunately. But even driving, we got the sense that it really IS the land of enchantment. Thanks for all the photos and details. The miniature village is amazing! And I got dehydrated hiking in the Grand Canyon once and will never make that mistake again. Felt like I was drinking water constantly, but…no. Apparently not. Thanks for sharing your trip! You know, I need to drink loads of water, more than I used to, when I’m mowing the lawn and doing other yard work at home in Pennsylvania. If I don’t, uh-oh. See you, Stacey. Have a good rest of the week. I’m ready to go back there for a good pie. Sold!! NM is now at the top of my “must see before I leave this earthly realm” list! A very fine place. I hope to get back there one of these days. On the other hand, there’s a zillion good places that I’ve never been to. Decisions, decisions. Hi. Santa Fe is a good place to visit, for sure. And it’s a good base from which to take any number of day trips. Like many states, New Mexico is loaded with beautiful landscapes and other things of interest. See you. Enjoy the upcoming weekend. Any place that has olives, Georgia O’Keefe works, and all those wonderful mini-scenes of Mexican life from the Girard wing of the art museum–that’s a GREAT place to hang out in. Glad you and Sandy got to take a break from regular life (feeds the creative soul as well as the stomach). And I hope you thanked each and every NM citizen for NOT giving their 5 electoral votes to the Rump. Trump: Pathological liar; nasty; a creep; an enemy of democracy. Sign me up for Andrea Fisher Fine Pottery! Travel certainly revives and refreshes. Good trips are not only good for the soul but necessary! Hi. You’re right. My wife and I needed this trip. Thanks for dropping by. Much appreciated. Hi there, Jean. My wife and I were lucky to have such a terrific trip. I think that being there with my brother and sister-in-law made it better than it would have been. I appreciate your stopping by. Take care. Great post! I lived in New Mexico for 9 years. I lived an hour away from Santa Fe, in Albuquerque. I’m sure it was hot and dry. There’s lots to do and see in NM. I love gambling over there! Lol. Right, I noticed a lot of casinos! Thanks for visiting my humble site, Lisa. Appreciated. Thank you! I took a break but want to catch up on reading blogs. Hi there, Dave. If you go back, I bet you’ll enjoy the visit. Speaking of visits, thanks a lot for stopping by my section of cyberspace. I appreciate it. Hi there. Santa Fe is a winner. Before going there, I didn’t know what to expect. It sounds like a wonderful getaway, Neil. Zella would look good in a hat, I think 😉 I’m living vicariously through you with this trip! Christy, the next time I see Zella I’m going to try extra hard to convince her to wear a hat. But she can be stubborn! Thanks for stopping by. Enjoy the rest of the week. Great read. Sounds like a fine pljace. Interesting synchronicity my wife just finished reading out loud to me a fantastic piece of writing by the late Anthony Bourdan about Mexico. Its people, culture and of course rich culinary heritage. And of course troubled relationship with the US of A.
Hi there, and thanks very much for adding your thoughts. It’s very sad that Bourdain took his life. He will be missed by millions of people. He sure will. Keep them coming! Hi Michael. Glad you liked this story. Santa Fe awaits you! 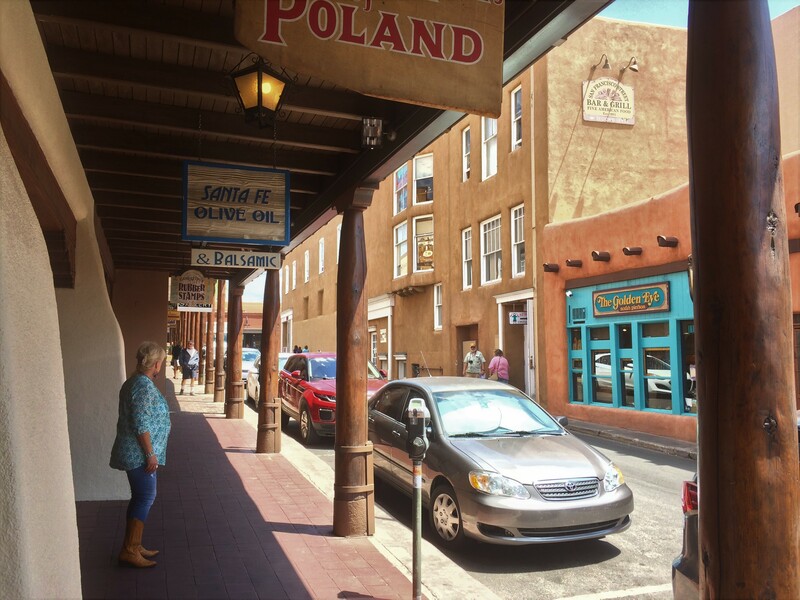 I really enjoyed this blog about Santa Fe New Mexico. I didn’t know that it was at that high an altitude. I like that it covered a number of subjects but possibly it was a little long for some Internet readers. It was probably enough material for three blocks and you could’ve added more pictures. Since it’s a drought situation I wonder about some things like water usage and how they handle it. I have wanted to go to Texas as well maybe your next trip you can check out Austin and I’ll read about your adventures there. If you haven’t read my two other New Mexico stories, you might want to take a look. You know, I’d like to get to Austin some day. Many people say that it’s a terrific city. I’ve never been to Texas. I loved Santa Fe 🙂 I’m overdue for another visit! Such a magical feeling about that town! Hello there. I agree. Santa Fe is terrific. It’s walkable, it’s cozy, it’s charming, it has a lot of history. This looks like a really interesting town, not what I really exected at all! I haven’t been to a Georgia O’Keeffe exhibition and I’d love to. We are making our first trip to the USA in a few weeks and are very excited but sadly won’t be able to make it all the way across to NM. Congrats for having your post chosen by another blogger to be featured on the #blogcrush linky, feel free to pop across and grab your ‘I’ve been featured’ badge! 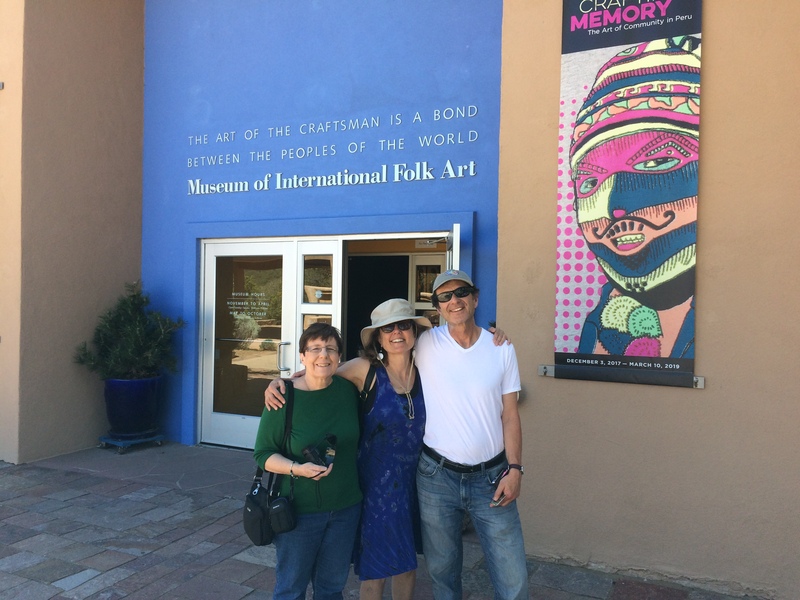 I enjoyed your tour of Santa Fe. I’ll probably never get there myself, but your blog post really left me wishing I could go! Thanks very much for saying that. I appreciate it a whole lot. Have a great rest of the week, Janet. Really enjoyed your New Mexico musings, Neil! Have been all around the state and always enjoy it.